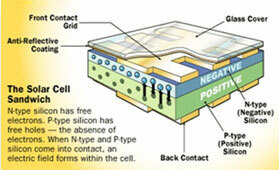 Electrical contacts connect each solar cell to another and to the receiver of produced current. The contacts must be very thin (at least in the front) so as not to block sunlight to the cell. Metals such as palladium/silver, nickel, or copper are vacuum evaporated through photoresist, silkscreened, or merely deposited on the exposed portion of cells that have been partially covered with wax. All three methods involve a system in which the part of the cell on which a contact is not desired is protected, while the rest of the cell is exposed to the metal. After the contacts are in place, thin strips ("fingers") are placed between cells. The most commonly used strips are tin-coated copper. 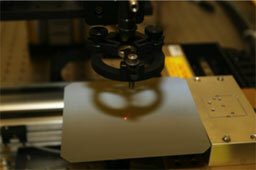 This is because pure silicon is shiny, it can reflect up to 35 percent of the sunlight. 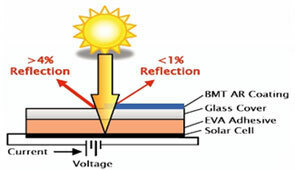 To reduce the amount of sunlight lost, an anti-reflective coating is put on the silicon wafer. The most commonly used coatings are titanium dioxide and silicon oxide, though others are used. The material used for coating is either heated until its molecules boil off and travel to the silicon and condense, or the material undergoes sputtering. In this process, a high voltage knocks molecules off the material and deposits them onto the silicon at the opposite electrode. Yet another method is to allow the silicon itself to react with oxygen- or nitrogen-containing gases to form silicon dioxide or silicon nitride. 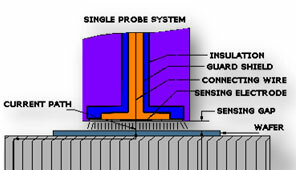 Commercial solar cell manufacturers use silicon nitride.